Poster sketch of the 2015 MIPTV poster. 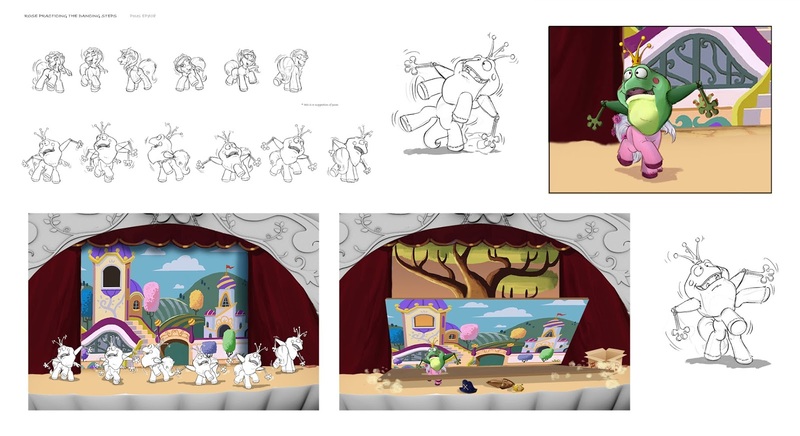 Even more concept images of Filly Funtasia have been shared on the internet, giving us quite a lot of new information about what the show (and/or specials) is going to be about, as well as what it will look like. 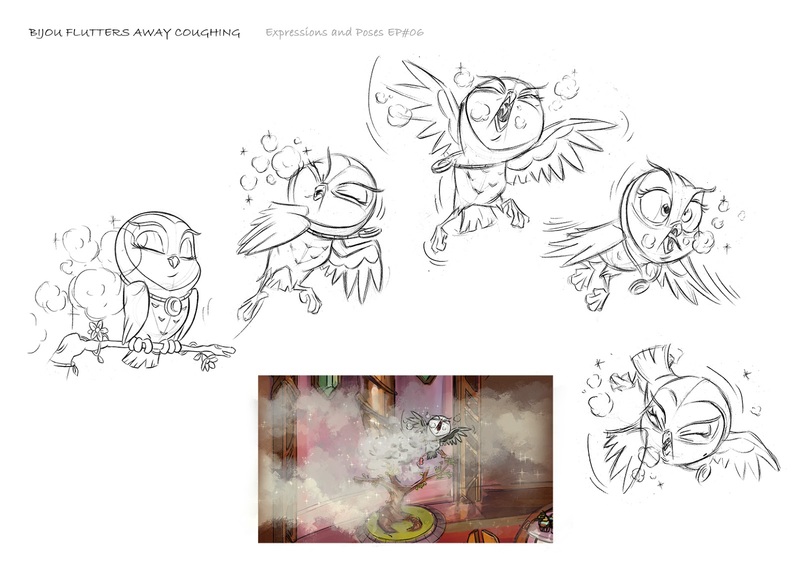 However, unlike the previous collection of concept art and the collection before that, this time the information is a lot more specific - to the point where it may actually be considered spoilers that may spoil potential surprises. The pictures will get increasingly spoilery as the article progresses. Hey! Listen! Look! Watch out! 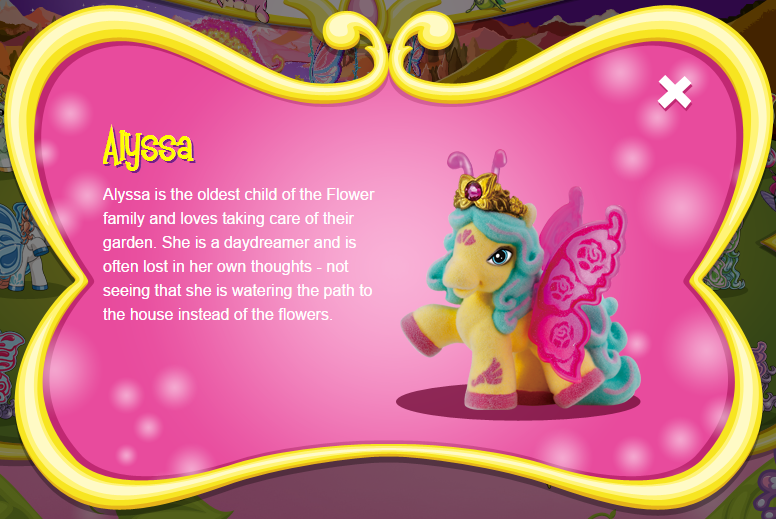 It's Alyssa from Filly Butterfly, along with a blue dragonfly friend! The dragonfly is wearing a medallion with a green emerald and pointing at something. The background of the scene is "Forest 7" from one of the earlier concept art posts. I was just watering these flowers and all of a sudden I'm talking to this dragonfly in the middle of the forest. 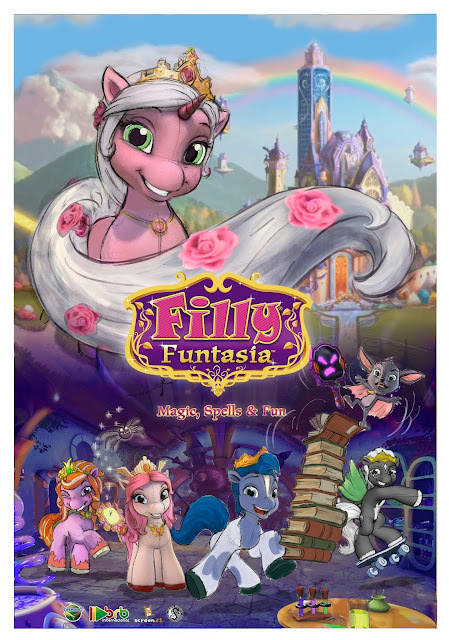 Is Alyssa the daydreamer going to have a role in the Filly Butterfly special? That remains to be seen! It's Alyssa again, but wearing a cerise-colored cape and drawn in a somewhat different style. The cape conceals her butterfly wings and antennae. 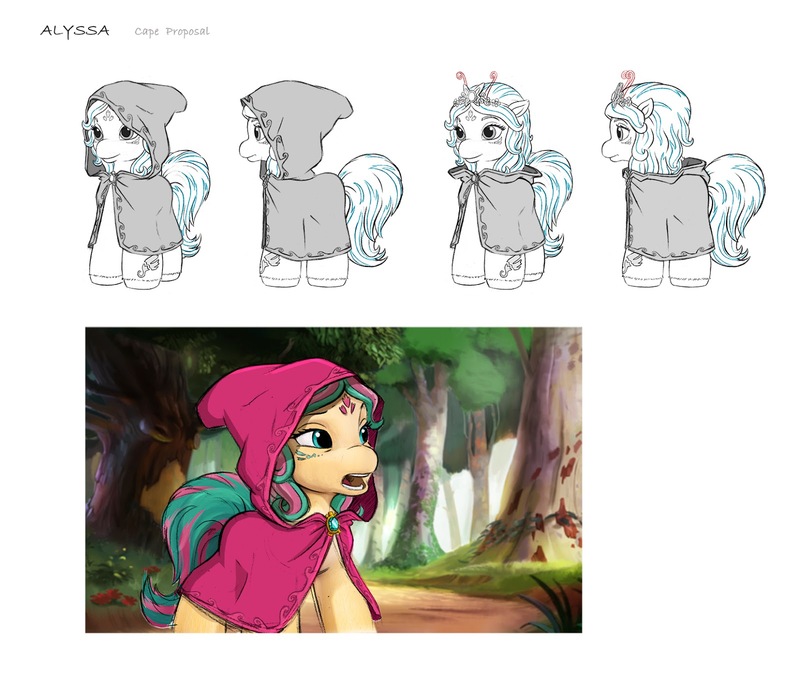 She's again standing in front of a forest, which is "Forest 10" from one of the earlier concept art posts. It's some poses for Antares! Who's Antares? 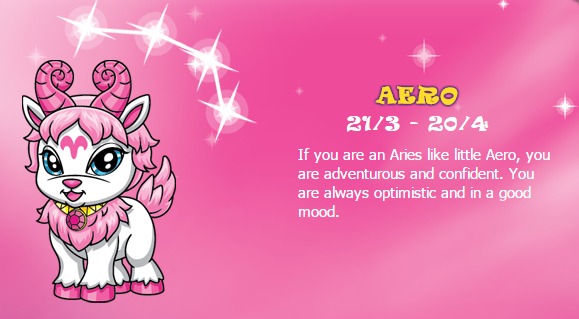 Well, he has both wings and a horn, so he's presumably a Filly Star, even though he does not appear in that toyline yet. 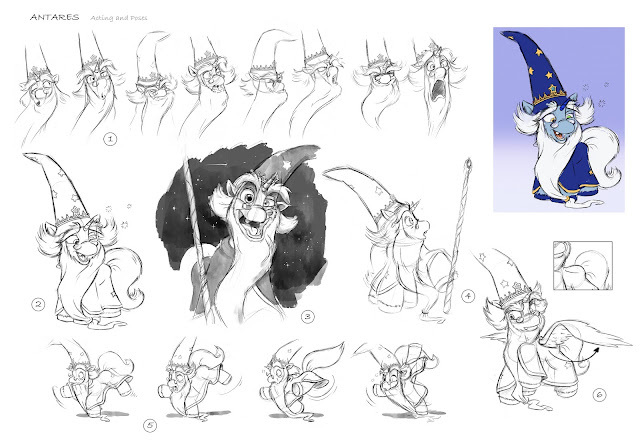 Also, there's stars on his wizard hat. 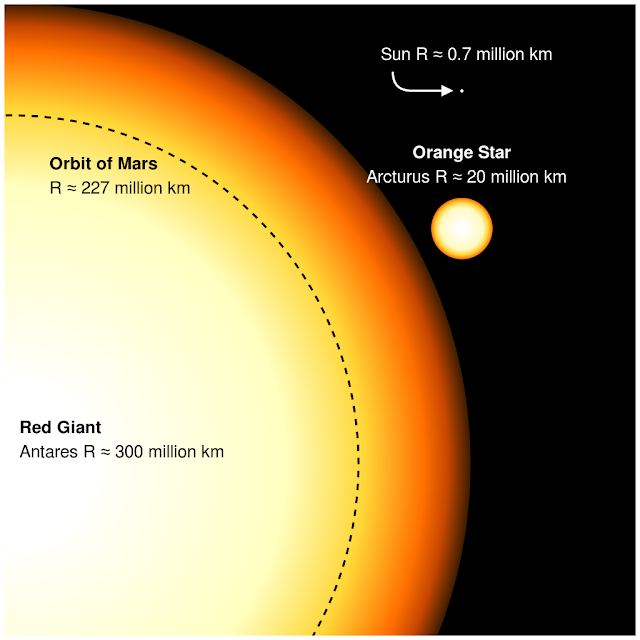 Furthermore, "Antares" is the name of one of the brightest stars in the night sky. It's a pretty big star. Poor Bijou. Let's hope that ends well. One day, the links on fillyfuntasia.com will be clickable. One day. With a nice little moon medallion that looks somewhat similar to Battiwigs' medallion. 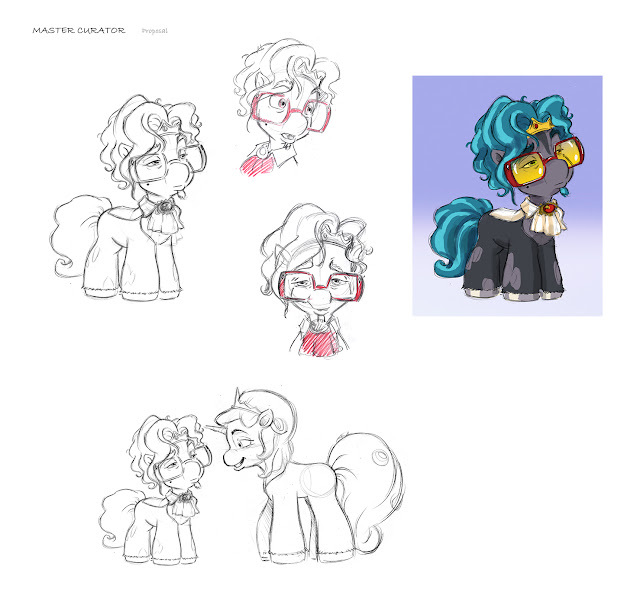 In the second frame, the Filly to the right has fallen over. Two frames of dancing poses from Episode 4, which should be "The Crush", according to the episodes listed on the official website. Presumably, Cedric is trying to impress Rose with his dancing skills, when Lynn joins in. Another scene from Episode 4 (likely "The Crush") sketched. 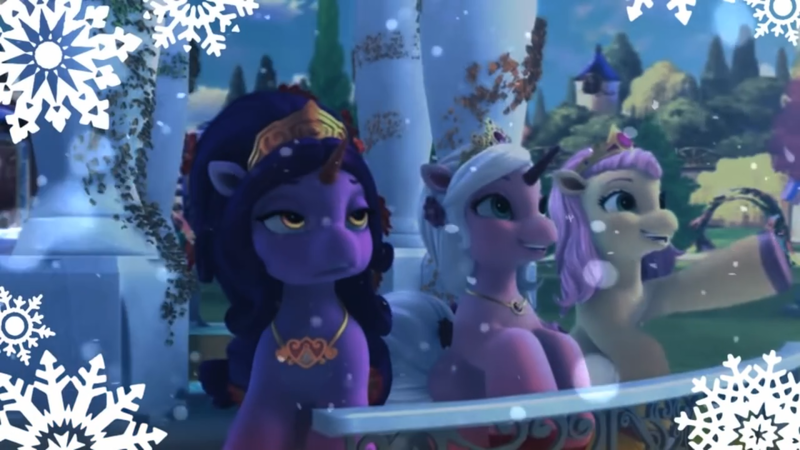 Melody and (Isa)bella are supporting Rose according to the sketch's title, but looking at that facial expression, I'm not sure how supported she feels. Yikes. As a sidenote, this is yet another appearance of Melody - who is not one of the main Filly five, but might just be a recurring character throughout the show. 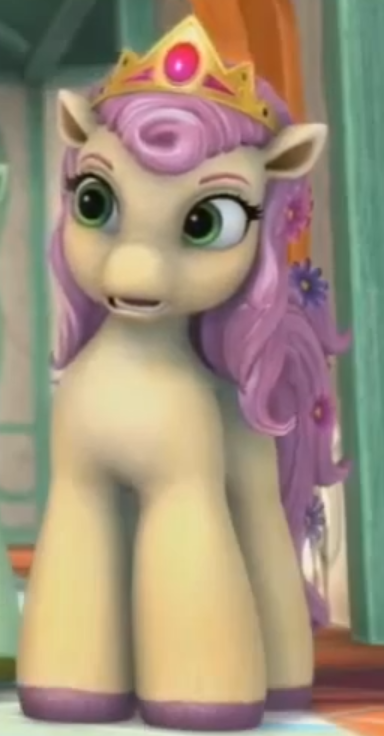 Melody has had her distinctive color scheme with a yellow body and pink mane since her first appearance in "Filly Princess" in 2008, retaining it in both Filly Funtasia and Filly Royale. She has appeared in the background of a lot of clips from different episodes that have been featured in the first, third and fifth promos. Evil mirrors: friends with bats, but not with ladybugs or horses. Wranglum being attacked by some rather cute ladybugs. Without more context, it's difficult to say what exactly is going on here. It's Aero, one of the Zodiac Filly pets from Filly Stars! Apparently the same size as Battiwigs. But will I meet a mysterious stranger? 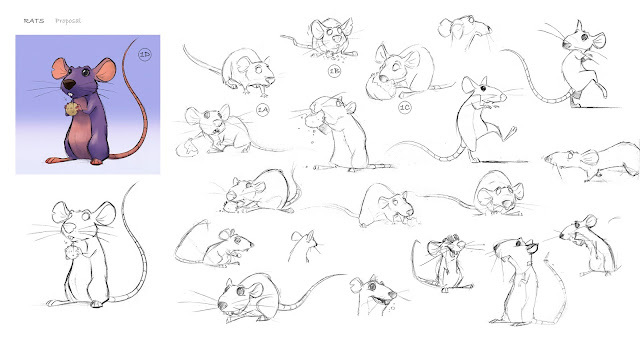 This would be the first hint that at least one Zodiac Pet might make an appearance in the animated content! Maybe more of them will? 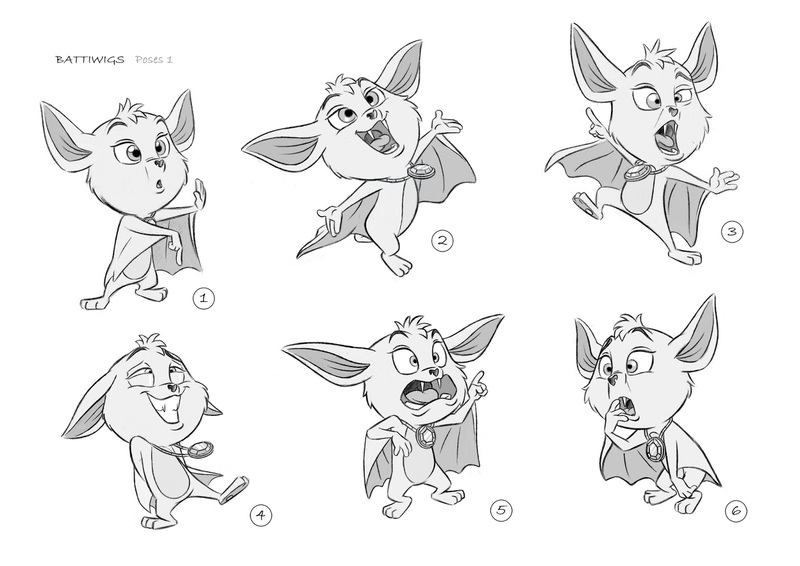 The six dance moves for "The Batti". It's the Master Curator! Right now, we have no context as to who this is or which episode he might appear in, but we'll hopefully find out in the future! I've seen it a few times now, but this cave still looks cool. This one should be recognizable! It's those scenes where Zack, Rose and Fabian walk through a cave. There is however something strange here - the title says it's "Poses EP#06". Now, that doesn't seem right. All previous information about this scene strongly suggests it's from the "Blue Rainbow episode" called "The Missing Student". That episode is listed as Episode #03 on the official website. Besides, previous images in this particular set of images have already suggested that Episode #06 would be "Bijou on the Loose" - and it seems unlikely that the owl episode would be the same episode as the episode with the blue rainbow and cave - which is probably the episode we have the most cohesive footage from. One possibility could be that "The Missing Student" was episode 6 at one point but was later moved, another is that this title is simply wrong. To add to the confusion, the 3D prop article seemed to suggest that the turquoise orb which is associated with the cave episode would actually appear in episode 5. Of course, the orb is not actually visible in these sketches so it is also possible that the cave scenes were originally part of a different episode. We first posted a picture of this mask in an article about 3D props back in May 2014. The filename suggested that it would be found in episode #08, which seems to agree with the previous image - but this does not guarantee that the episode will end up being the eight one in the final episode list as it seems the episode numbers may have been changed at some point during development. It's Zack's previously unknown father! 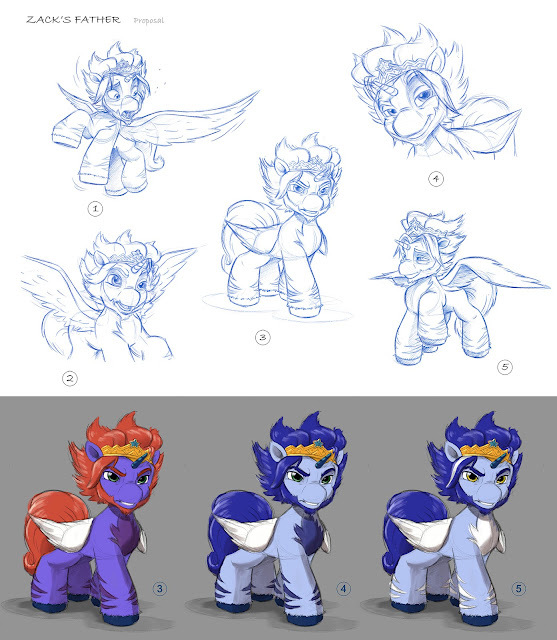 And three suggested color schemes! He has not appeared in the Filly Stars toys, nor (as far as I know) in any other media. It's expressions for Petunia, which seems to be the name of the Filly that appeared briefly in the Filly Funtasia holiday promo. 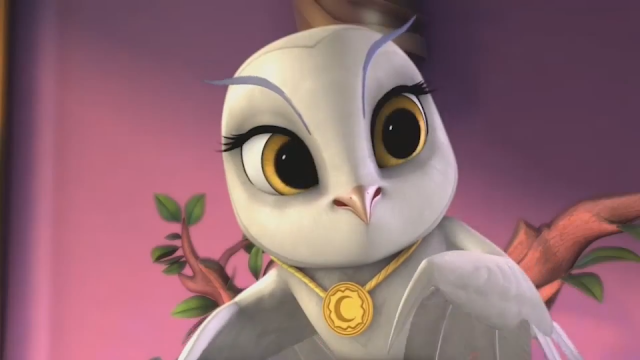 Petunia seems rather upset here! While this is the end of this article, there are two more images that were part of this set. These were so very spoilery, that they might ruin the fun for some people. For that reason, they have been put on a separate page which is linked below to protect careless scrollers from them. 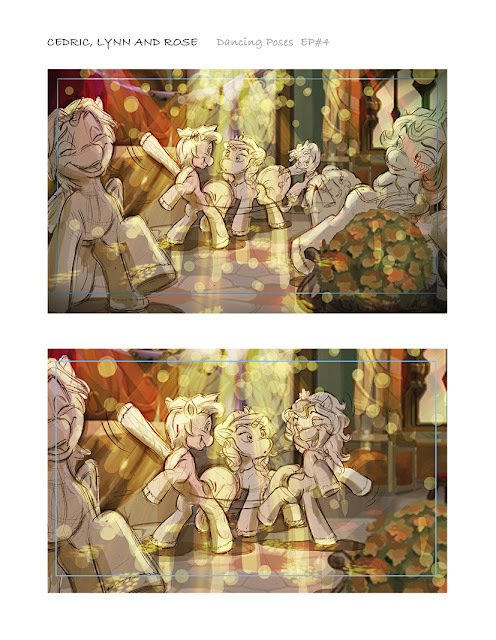 Please discuss the content of these final two images only on the comments for the linked page, and not on the comments on this page. Well, that's about it, except for an alternate sketch of the poster which this article began with. Rose has a more prominent role in this version! With thanks to Zejgar for contributing material for this article.